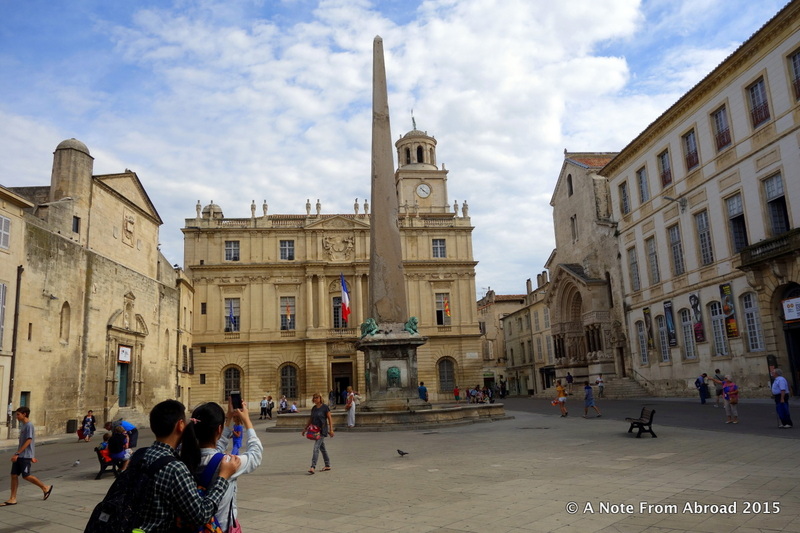 ← Avignon, France ~ Did you know there once were THREE Popes all at the same time? The ship is docked on the Rhone river in Tarascon, France. 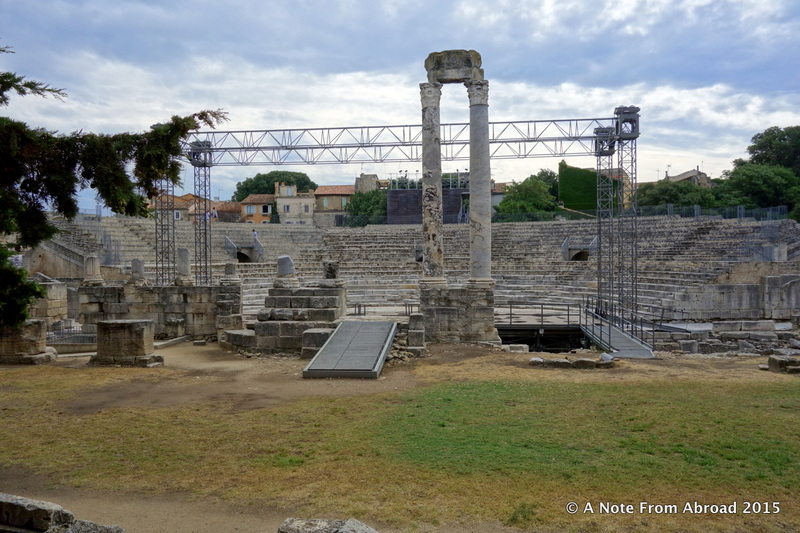 Our morning started out with a bus trip to Arles where we filled in a few more details from the life of Vincent van Gogh. Along the way we passed field after field filled with bright yellow sunflowers. Vincent van Gogh ~From February 1888 until May 1889, Vincent lived in Arles. It was during this time that he famously cut off his ear and was hospitalized. 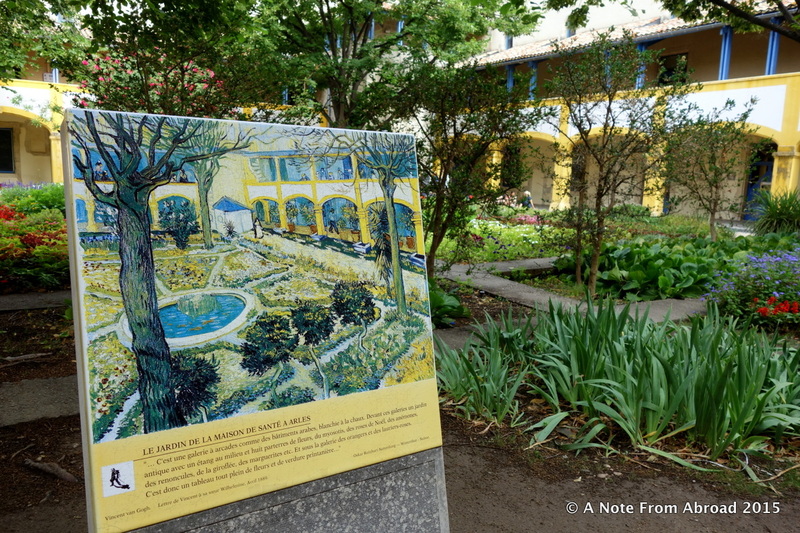 We visited the hospital where we could observe the setting for his painting Garden of the Hospital in Arles (also known as the Courtyard of the Hospital at Arles). 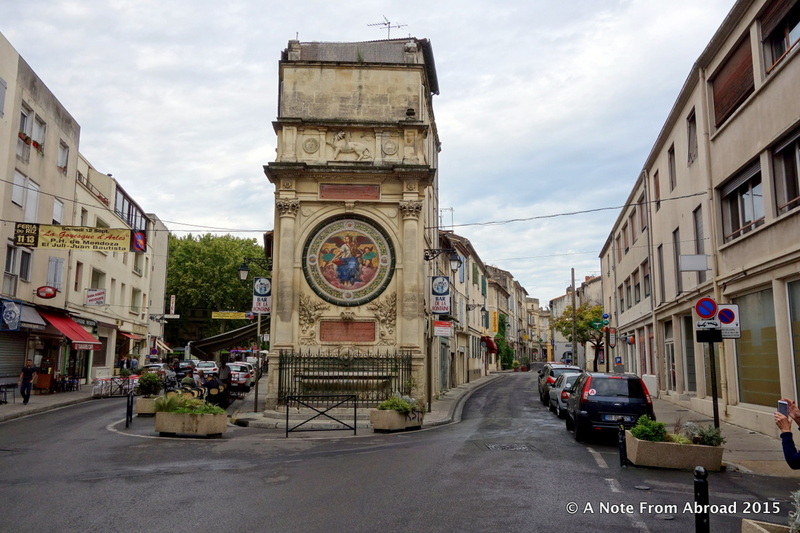 A couple more Van Gogh’s paintings and the sites where they were done. Birthday Celebration ~ Since we were getting off of our floating home, the SS Catherine the following morning, Nelson arranged for an early birthday celebration for Tim at dinner. His actual birthday is August 2nd. The staff brought him cake and gathered round to sing happy birthday to him. Gratitude Moment: How sad we are to have our two-week Uniworld cruise come to an end. We have nothing but wonderful memories from this fabulous cruise. There were so many special moments that included seeing a wide array of scenic and historical sites, being spoiled daily by a well-trained, professional staff, sleeping on an extremely comfortable bed, eating one gourmet meal after another, and making new friends who I sincerely hope we will meet up with again someday, perhaps on another Uniworld cruise. 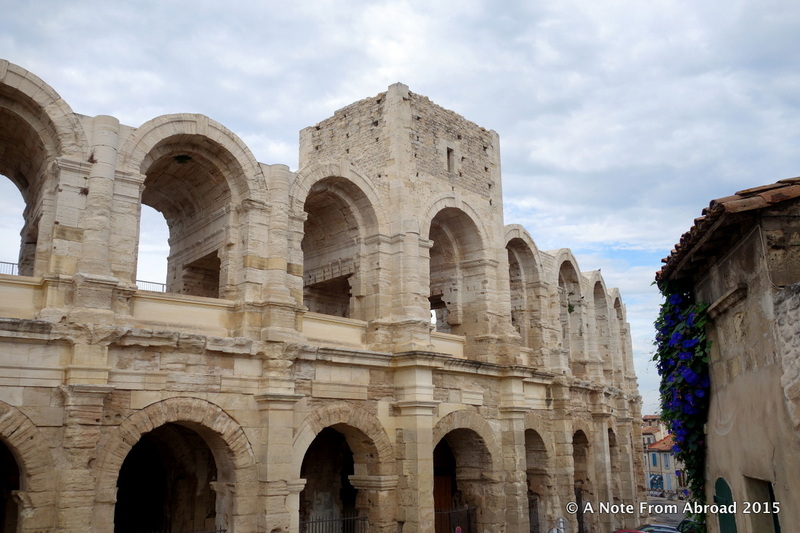 This entry was posted in Europe, France and tagged Amphitheater, Arles, Cruise, France, Obelisk, Photography, Place de la République, River Cruise, Tarascon, Tim's Birthday, Travel, UNESCO, Uniworld, vacation, Van Gogh, Vincent. Bookmark the permalink. It is always so fun to see the inspiration of an artist. I love seeing the location and the painting! Thank you! Van Gogh was an amazing talent. Sad that he only sold ONE painting while he was still alive. Its amazing that this was the case isn’t it? One of the great ironies. I love seeing the setting and the painting too! Thanks. I’ve always thought I’d like to do a river cruise. I can highly recommend doing one. I love that you only have to unpack once, all meals are included as well as daily excursions. J and T, I really loved vicariously sharing your trip! have been to France a few times and to most of these places – so i enjoyed reading about/seeing them thru your eyes… So happy you enjoyed the time abroad and HAPPY BIRTHDAY TO TIM! 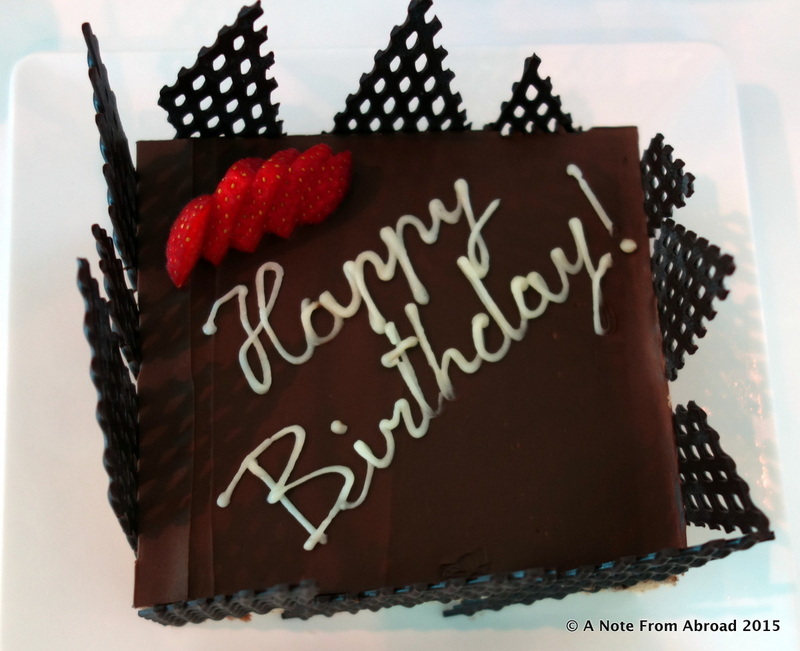 what a special time- to be on a trip – and have a birthday! all fine here… lately I have had a lot of really terrific family time with Katie (and Wes, and Craig when they can get away from work) and the three kids.. especially at our shore house. Enjoyed sharing w Alice as she was conquering a two wheeler and now she is riding w us all over the island, so independent and proud of herself! … she starts 1st grade in two weeks, is reading a lot, and growing up, ohhhh.. but ,,, every stage is amazing! and Glenda has joyfully learned to play Candyland! just 3, she is sweet and such delightful company! Jack is six months already! is crawling and pure baby…happiness! Craig and I leave this week for a bit of a vacation in lovely Bermuda, going w another couple… should be a lot of fun. We have not been there in years… but have enjoyed it in the past. We are staying in a large house w a pool, looking forward to it. And, looking forward another “end of summer” long weekend at LBI with the family, mark and andrew too- for the Labor Day weekend. I try hard to continue the summer beach days into Sept, altho my things to do and obligations here get busier… so nice there once people are back in school … beaches are empty and Sept and Oct days are usually the best temperatures yet the ocean and bay are still warm. I have been feeling good, luckily- we wonder if it is b/c of the juicing? the Vit D? the gluten free diet? whatever it is, I am continuing it all, and am so happy to be able to be quilting and swimming… and doing some crafts and gardening. RUthie and I took a lot of time together and created a shutterfly book about our trip to Africa, should be in the mail today or tomorrow! we used my photos -mostly, and lots of her diary entries… was a LOT of fun to work together and remember all the great things we did on that trip! Am also REading a lot this summer… and happily, I’m not napping so much at all! The fatigue seems to have been lessened! Meanwhile, I am continuing to very slowly taper the prednisone, ever mindful of the traps and potential for setbacks and flare ups, but always hoping to see the end of it … tho that seems years away. right now I am heading up to Princeton ( bout 50 min) to my mom’s, have recently taken on her banking and finances( she is 92) and try to spend a morning w her each week… she is amazingly healthy and competent- yet appreciates my company and loves that she no longer is doing that stuff. And I am happy to be able to help . 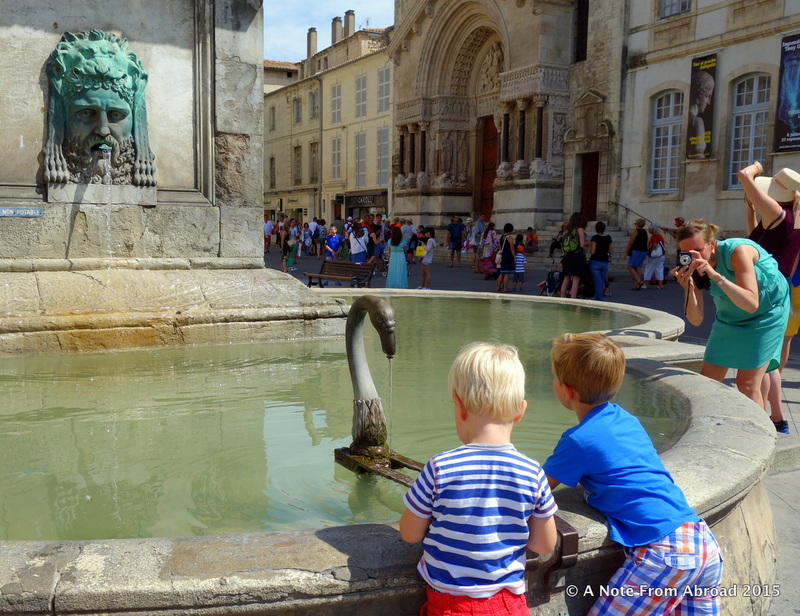 anyway… l loved your newsletters this summer and thank you for sharing your fun travels and all the wonderful times! hope you are enjoying these last aug days and that the fires are not a hindrance for you. Dear Anne, how lovely to hear your latest update. It sounds like you are really enjoying life with the family, but especially happy that you are feeling healthy. How fun that you and Ruthie worked together making a shutterfly album from our trip. They make the best souvenirs don’t they! Enjoy your “end of summer” time. I can’t believe how fast this year has gone by. Big hugs to you and Craig, and please say hello to Ruthie and her hubby for me.